BlogHer recently tapped some of us food bloggers to review Fage Greek yogurt products and I jumped at the chance to give these products a run. As you know, I have my own dairy goats and I make chevre (Making chevre cheese from our home-milked goat milk) and yogurt from this home-milked milk (The world is in a Ferment – also – homemade Yogurt). Its super delicious and very fresh. Fage yogurt, I am assuming, is made from cow milk (packaging doesn’t designate a species so this is why I assume this) so it will take different from the yogurt that I make from goat yogurt. 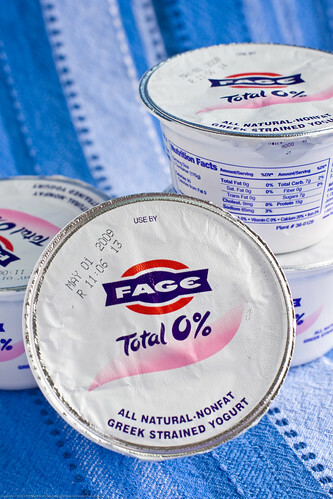 Their site says that Fage is the biggest dairy company in Greece where they make 500 million pots of yogurt a year. They talk about how their yogurt is strained to make the unique texture. Indeed, when you begin to make your own yogurt, you learn about how you can set it up in some cheese cloth to allow excess moisture drip away, making a cream cheese like texture – very delicious. Fage must do this but to a lesser extent, not making a yogurt cream cheese but a super rich yogurt product. You can see an animation of the way they make this yogurt at this link. For today’s recipe which is a new creation of mine, I used the 0% fat Fage yogurt (plain). When you open the seal you encounter another paper that overlays the yogurt (not exactly sure why but just be sure to remove it). The yogurt is nothing like any of the other usual yogurt suspects and that is a very good thing. Its thick, unctuous, creamy, pure white, and has a delicious tart yet not overpowering flavor, perfect for recipes. 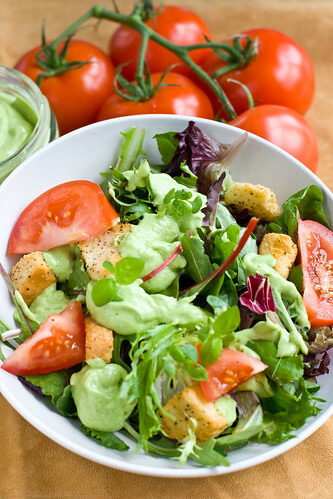 Unlike other dressings that seem to merely lubricate the eating of one’s greens, this dressing is almost a meal in itself! 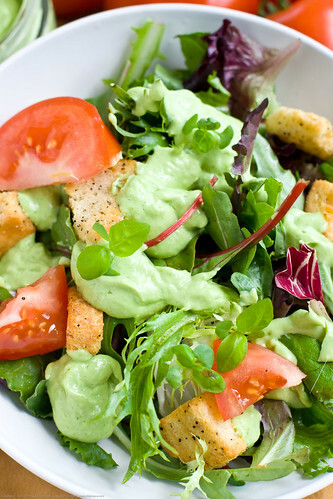 It will definitely boost the protein and nutrition of any salad. The 0% fat Fage might be only 90 calories for the whole 6 oz. pot but that same 6 ounces has a whopping 15 grams of protein! 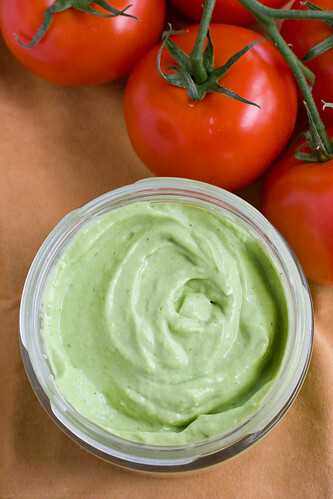 My whole family LOVED this dressing and, while doing some nefarious experimentation unbenownst to me, they even liked it on popcorn of all things. If you try that, let me know. Note: The Fage 0% fat greek yogurt is VERY rich and creamy. It is also thick. If you use a different yogurt, you may get different results, especially with respect to the texture and moisture content. Turn on your Vita Mix (blender) and turn it up to 10 and drop garlic and onion onto moving blades (with lid on!). Add whole 6 ounces of the Fage 0% fat greek yogurt, buttermilk, avocado, cilantro, lemon juice, salt, and then blend on 10 (low) on the Vita-Mix until smooth. If the dressing is too thick, add some buttermilk slowly until it is the consistency you like. How do you eat FAGE? What is your favorite flavor? Why do you love the pure, creamy, ridiculously thick goodness of FAGE yogurt? Enter to win by following this link and then by leaving a comment at this BlogHer page, sharing your thoughts about FAGE and you could win a free case of FAGE! There will be a new winner every day! I have been hearing about Greek yogurt all over the place but never did hear why it is so different from other yogurts until now. Amazing that it has zero fat but is so thick and creamy. I’d love to give it a try. The dressing sounds yummy as well. Connie: glad I was able to fill in that bit of info! I am going to try this tomorrow! Sounds great!